On Friday evening, we went shopping for bifold closet doors to replace the set that's been wobbly and broken for nearly two years. Later, we enjoyed the first cool evening of the year by grilling burgers with Tammy on the back porch. Even the mosquitoes were reasonably calm. 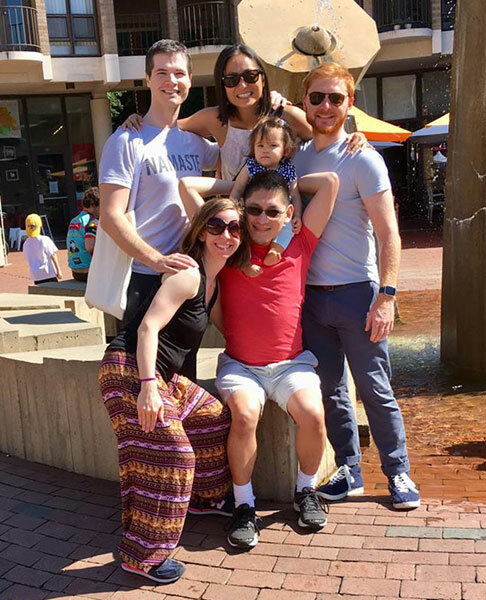 On Saturday morning, we met up with Jonathan, Michelle (previously of Reston), and Stu at the Lake Anne Farmer's Market. Michelle and Stu were in town for a wedding, having moved to Berkeley last summer. Rebecca and Maia ate nitro ice cream and then we all had brunch at Cafe Monmartre. In the evening, we had dinner on the patio at Chuy's and then let Maia enjoy the "greens" at Cascades Overlook. On Sunday, I mowed the portion of the lawn that wasn't the consistency of jello, and did some optimization of storage spaces in the house. In the evening, Michelle stayed with us to be close to Dulles for her return flight and we had a little gathering of her old yoga friends.